The wood coach that was up on the coal trestle in Wycombe definitely fell apart in place. I recall in the 1980's it was moved up there in one piece, but with a definite sag and started to degrade quickly, it was later moved to the siding near the station, where it literally fell apart where it sat. Last time I saw it in the early 2000's, it was trucks and end platforms only, the rest had been taken apart or burnt in place. Sad end. Going back a few(!) years, the Enterprise, which was a former PRR car, went from the (first) Adirondack to one of the lines on Cape Cod. One of the BAR combines ("potatoes in the middle, people on the ends", to quote John Bishop) was used as the BR&W station in Flemington for awhile. I'm not sure what happened to it or the other BAR combine. As noted, one of the two straight coaches fell apart at Wycombe. The other went to a restaurant in either RI or CT and was resently moved to one of the museums in New England. Either the Wycombe car or the RI/CT car was Lackawanna. Not sure what happened to the wooden business car, but the steel underframe RPO was at New Hope awhile ago; I believe it came from the Belfast and Moosehead Lake. Seeing the number 400 got me to thinking; was Enterprise also numbered 400? BR&W's original diesel was ex-LIRR 44 ton 400. When the SW-1 came up from Broward County Port Authority in Florida, it was numbered 400 already. It became 401, with a masking tape '1' on the number boards, at least until the GE left for CT. They were usually called big and little 400, though. NOTE: just found a published roster, apparently there was only one full coach. 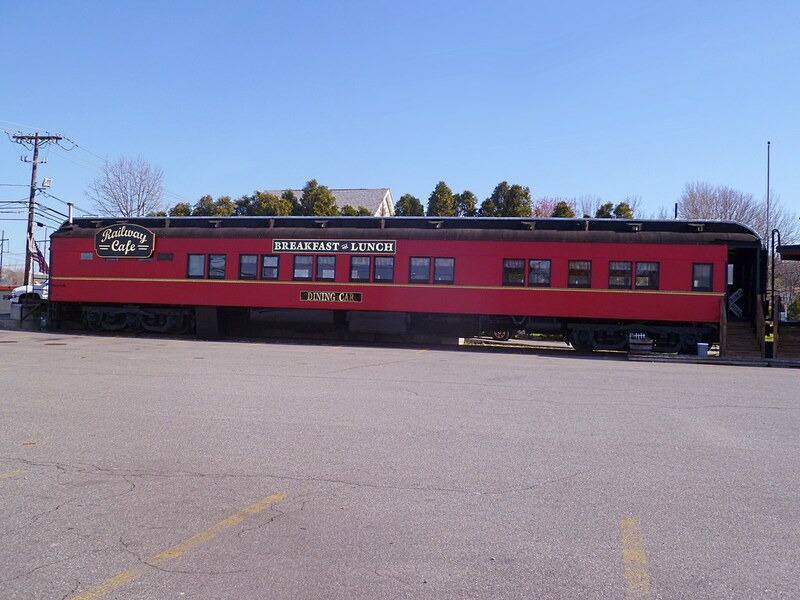 So maybe the DL&W fell apart at Wycombe, and the business car (not a coach) went to the restaurant in New England. I'll try to post the roster this evening. Being a boomer I've seen too much equipment over the years; it can get confusing. I know where one of them ended up. It is next to the Great Meadows (NJ) station on the former Lehigh & Hudson River. Here is a photo of it a couple of years ago. The good news is that is currently under a serious restoration by the owner. I will try to stop by and get a current photo in the next few days. I dug up my copy of the 'Black River and Western Story', written in 1973 by Virginia Smith, just before going out on a family outing this morning. As I had noted in the postcript to my earlier post, there was only one wooden day coach, BR&W No. 103, built for the Lackawanna in 1895. 100 was the B&ML baggage RPO, built in 1906; 101 was the 1881 built BAR combine (Flemington ticket office); 102 was the other BAR combine (1884); there apparently was no 104; and 105 was the Canadian Northern business car from 1895. The Pullman parlor car, Enterprise, was ex-PRR, and built in 1912. However, its number at BR&W was 700; so there were only two 400s on the property. I'm looking at a picture of BR&W no. 104, a wood, open platform, four axle coach. I won't post since it's not my photo, but I would say it did indeed exist. "As veteran B&LE engineer 'Tex' McCann observed, if Pennsylvania had a drawbar on it, a Bessemer 400 (DRS6-6-1500) would surely try to 'shake and wiggle' it." I was citing the roster from the book, with no 104 listed. I just searched on RyPN and found that there WAS a 104, built for the Philadelphia and Reading, later owned by B&MR and then sold to Black River. It went to the Yankee Silversmith Inn, Wallingford, CT in August, 1970, before the book was published. So the car that died over at Wycombe had to have been the Lackawanna car. 'Trainspot' also took a picture of 101, the Flemington ticket office, an addition to his shot of Enterprise/700, cited above. There is a comment with the image that 101 was torched a few years later. That would mean that the Great Meadows car must be old BR&W 102. I was just sent information that would suggest the car in MO is not the Enterprise. I had gotten the info. from what i thought was a reliable source, sorry for the false information. The car in MO is the Independence. That was one of the former High Iron Co cars. So does anyone know what did happen to the Enterprise after it left? Seeing that photo of the train in Flemington reminds me of how I miss being able to ride in those ex-DL&W Boontons with their original rattan seats. What a throwback they were. Information was just shared with me about a previous discussion on rypn about the Enterprise from 2007. The car is located in Somerset, MA and is part of a cafe. Here is a photo from April 2012 showing it being farily well taken care of considering its current used. Looks like EDM beat me to this post. The YSS 104, ex-B&ML 10, orig. P&R 910, moved from BR&W Aug 26, 1970 to The Yankee Silversmith Inn, in Wallingford, Ct, and from Wallingford to The Ct Eastern RR Museum in Willimantic, Ct on Aug 14, 2009. Joining her ex-BR&W Friend, 44 Ton GE Switcher, BR&W #400, a.k.a. little 400, orig. LIRR 400, who came to us via the Valley RR (in Essex, Ct). The CN business car, what is left of it, is on a land locked section of track at a farm in Clearwater, NJ. It is visable, during winter months when the trees are free of leaves, from the road that runs between Route 31, at the trafic light in Asbury, NJ and Route 57. It's on the south side of that road. The car roof was neglected and the interior of the car is in real bad shape, as of about 5 to 10 years ago. I remember this car when my Dad (W.R. Whitehead) purchased it in 1960. I lived in this car for a couple of weeks during the winter of 1960, as it sat in Chester, NJ, after I graduated from HS. One fond memory was on one morning, while I was living in it, my Dad showed up with some bacon, eggs, and bread and butter for breakfast. We fired up the galley coal stove and he cooked the bacon and eggs and toast over the coal fire. The car had a genuine "ice box" and a functioning hard coal fired gravity flow baseboard hot water heating system. The car was in like new condition when Dad bought it, having been well cared for by the CN. It was a real bummer to see it in its present condition. I had stayed in the CN business car overnight a few times when I was working on the BR&W. Always had a great night sleep. Never fired up the kitchen stove, but did have a few meals from Stewarts Root Beer at Copper Hill and take out breakfast from Moms Diner in Ringos in the lounge. I sort of wish I took up Nelson Towers ( train-master and BR&W VP in the late 70’s ) offer to sell me the car if I got it off the property for $100.00 ( I was never sure if it was real offer or a joke) Being 17, no money and still in 12th grade, it was not feasible. I hope she gets rebuilt in the future. Hi Guys, anyone have a list of what is still at Wycombe? Also, what happend to the wooden cars that where at Buckingham in the late 70's ? I think there were two Reading WW2 cabooses and a Rdg Milk car.